Floortime was developed by child psychiatrist Stanley Greenspan. 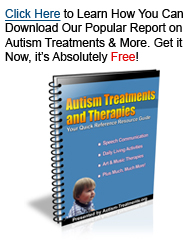 It is a treatment method and a philosophy for interacting with children that have autism. It is based on the premise that the child can increase and build a larger circle of interaction with an adult who meets the child at his current developmental level and who builds on the child’s particular strengths. The idea of Floortime is to move the child through the six basic developmental milestones that must be mastered for emotional and intellectual growth. The six basic developmental milestones were described by Greenspan as: self regulation and interest in the world; intimacy or a special love for the world of human relations; two-way communication; complex communication; emotional ideas; and emotional thinking. A child with autism has trouble moving naturally through these milestones because of sensory over or under reactions, processing difficulties, and/or poor control of physical responses. What needs to happen with Floortime is for the parent to engage the child at a level the child currently enjoys, enters the child’s activities, and follows the child’s lead. From a mutually shared engagement, the parent is instructed how to move the child toward more increasingly complex interactions, a process known as “opening and closing circles of communication.” Floortime does not separate and focus on speech, motor, or cognitive skills but rather addresses these areas through a synthesized emphasis on emotional development. The intervention is called Floortime because the parent gets down on the floor with the child to engage him at his level.